• Artist : Shepard Fairey. I have other Shepard Fairey and Ravi Zupa prints available. • Title : Spirit of Independence. The print has slight rubbing in her hair (see photos). • Print Type : Screen print. 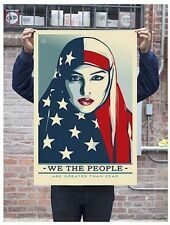 • Artist : Shepard Fairey. I have other Shepard Fairey and Ravi Zupa prints available. • Title : Fear of a Black Planet Letterpress. • Print Type : Letterpress. • Paper : White cotton paper with hand-deckled edges. Artist: aelhra. Mr. Brainwash, or others. Dragon Lady 2 (2016). "FRUITS OF OUR LABOR"by Shepard Fairey aka Obey Giant, released in 2015 by the artist. The Fruits of Our Labor print was inspired by a couple of things: the genetic modification of fruits and vegetables, and the military industrial complex. "Greater Than Fear"by Shepard Fairey aka Obey Giant, released in 2017. Proof of provenance. Unsigned open edition. See pic #5. Title: LOUIS VUITTON LV COCA COLA BOTTLE. Andy Warhol never enjoyed his Soda Pop like this! Is it a Coca Cola refreshing drink or is it Louis Vuitton luggage?. Artist: MR CLEVER ART. This artwork is part of the artist's Soda Pop Series. 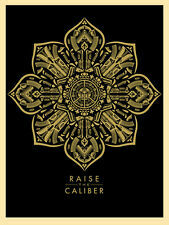 "RAISE THE CALIBER"by Shepard Fairey aka Obey Giant, released in 2015 by the artist. Mint condition, sharp edges and corners. • Artist : Shepard Fairey. I have other Shepard Fairey and Ravi Zupa prints available. • Print Type : Screen print. • Paper : Very light paper. • Numbered : Hand signed and numbered edition of. This is a final sale. Mint condition, sharp edges and corners. • Artist : Shepard Fairey. I have other Shepard Fairey and Ravi Zupa prints available. • Title : 50 Shades of Black Album Cover Sticker Sheet. • Paper : Glossy Sticker. Shepard Fairey Obey Presidential Seal Set SIGNED AND NUMBERED- RARE 2007! Shepard Fairey Obey Presidential Seal Set (Black and Red) Matching #'s SIGNED AND NUMBERED- RARE 2007! Near mint condition. You can pick this up if you are near San Diego. • Artist : Shepard Fairey. I have other Shepard Fairey and Ravi Zupa prints available. • Released : 2017. • Title : Dark Wave SIGNED. • Numbered : Hand signed open edition. This is a final sale. • Artist : Shepard Fairey. I have other Shepard Fairey and Ravi Zupa prints available. • Print Type : Screen print. • Paper : Cream Speckle Tone. • Title : Ideal Power. The print has slight rub marks (see photos). "EARTH CRISIS - Letterpress"by Shepard Fairey, released in 2015. Letterpress print on 10" x 13" (25x33cm) 100% cotton paper. Mint condition, sharp edges and corners. Signed and numbered in pencil; limited edition of 450. • Artist : Shepard Fairey. I have other Shepard Fairey and Ravi Zupa prints available. • Condition : In great condition, all corners are crisp,the print has slight horizontal rubbing at top (see photos). "OBEY PRINT AND DESTROY - Letterpress"by Shepard Fairey, released in 2015. Letterpress print on 10" x 13" (25x33cm) 100% cotton paper. Signed and numbered in pencil; limited edition of 450. Print number 438/450. "THEY LIVE"by Shepard Fairey aka Obey Giant, released in 2011 by the artist. "ROSE SOLDIER - Letterpress"by Shepard Fairey, released in 2017. With war and gun violence remaining constant, I’d like this print to remind us to push for peace. The image is also designed as a stencil, so use it as a guide to make your own if you are inspired. SHEPARD FAIREY. Obey Giant. CAPITAL GAIN PRINT 2015. WITH THIS NETWORK WE SOURCE ARTWORKS. ~We Have a Network of Collectors from All Over The. ~IF YOU DON'T see A Print In Our Gallery just reach out. Class: Art Print. His art is graphically alluring and viscerally tactile, but also existentially provocative because of his simultaneous creation and destruction. He’s creating sophisticated work for an artist at any age, but especially for such a young guy.". Shepard Fairey Obey Giant Authentic Bauhaus Silver 48/150 SIGNED # Inc STENCIL!! Only 150 of silver were printed. This one is 48/150 and is hand signed and numbered. Never used. It just fell off due to the deep die cut. Includes Letter of Authenticity. 18" x 24" (border); 17" x 23" (image). Shepard started by placing stickers on his skateboards and in public places around Rhode Island where he was attending art school. •Artist : Shepard Fairey Collaboration with Jamie Reid. I have other Shepard Fairey and Ravi Zupa prints available. •Title : Be Reasonable and Suburban Pressure SET. •Print Type : Screen print. •Numbered : Hand signed and numbered edition of 375 (232/375 ). See pic #5. Title: LOUIS VUITTON LV POP SOUP CAN. Andy Warhol never enjoyed his Soup like this! Is it hot soup or is it Louis Vuitton luggage?. Artist: MR CLEVER ART. This artwork is part of the artist's Pop Soup Series. "Kai & Sunny for Shepard Fairey - Yellow"by Kai & Sunny and Shepard Fairey, released in 2017. Mint condition, sharp edges and corners. "PYRAMID TOP ICON - Letterpress"by Shepard Fairey, released in 2016. Letterpress print on 10" x 13" (25x33cm) 100% cotton paper. Signed and numbered in pencil; limited edition of 450. Print number 181/450. "CHINESE SOLDIER - Letterpress"by Shepard Fairey, released in 2014. Letterpress print on 10" x 13" (25x33cm) 100% cotton paper. Mint condition, sharp edges and corners. Title: DOM PERIGNON CHAMPAGNE SODA POP BOTTLE. See pic #5. Artist: Mr Clever. This artwork is part of the Artist's Soda Pop Series. It was created using a multitude of art tec hniques such as paint, spray paint, digital manipulation and digital illustration, stencil and more went into creating this wonderful artwork. See pic #5. I seem to have misplaced my bottle of Dom?. Artist: Mr Clever. It was created using a multitude of art techniques such as paint, spray paint, digital manipulation and digital illustration, stencil and more went into creating this wonderful artwork. It is unsigned and not numbered. It has a few dings and a small tear around the border-see pics. Title: CHANEL NO. 5 X KIKKOMAN NATURALLY BREWED LUXURY SOY SPRAY PARFUM. Chanel No. 5 X Kikkoman Naturally Brewed Luxury Soy Spray Parfum is made with SOY and a scent of POP to it! See pic #5. Artist: Mr Clever. See pic #5. Artist: Mr Clever. It was created using a multitude of art techniques such as paint, spray paint, digital manipulation and digital illustration, stencil and more went into creating this wonderful artwork. Shepard Fairey Obey Giant Mujer Fatal Print AP SIGNED AND NUMBERED- RARE 2007! Near mint condition. You can pick this up if you are near San Diego. Shepard Fairey Obey Giant Peaceful Protestor Art Print Letterpress Signed by Shepard Fairey AND Jim Marshall Numbered edition of 450. 13 X 17 inches On cream cotton paper with Deckled edges. Print is in hand and is in mint condition. Will be held flat until purchase. See our feedback and know you’re in good hands. Thanks for your interest. • Artist : Shepard Fairey. I have other Shepard Fairey and Ravi Zupa prints available. • Title : Big Kids Little Kids Book Cover (Drumset) ONE OF A KIND. • Note : Only 100 of these were made as covers for the book "Big Kids Little Kids.". • Artist : Shepard Fairey. I have other Shepard Fairey and Ravi Zupa prints available. • Title : Print and Destroy Letterpress. • Condition : In perfect condition, edges are deckled, the print has no flaws (see photos). • Artist : Shepard Fairey. I have other Shepard Fairey and Ravi Zupa prints available. • Title : Peace Guard 2. • Print Type : Screen print. • Condition : In great condition, all corners are crisp,the print has slight rubbing on the right side of the hat (See photos. ). 24" x 18" Hand Numbered/Signed out of 400. Shepard Fairey "Wake Up" Matching Set. "BLOOD AND OIL MANDALA - Blood Drop"by Shepard Fairey aka Obey Giant, released in 2017 by the artist. Mint condition, sharp edges and corners. Cream"by Shepard Fairey aka Obey Giant, released in 2017 by the artist. Mint condition, sharp edges and corners. Shepard Fairey - Embrace Justice. Check em out. "GIANT MUSTARD AND NAVY - Letterpress"by Shepard Fairey, released in 2014. Letterpress print on 10" x 13" (25x33cm) 100% cotton paper. Mint condition, sharp edges and corners. Signed and numbered in pencil; limited edition of 400. See pic #5. Andy Warhol never enjoyed his Soda Pop like this! Title: ENJOY STARBUCKS SODA POP CAN. Is it a Coca Cola refreshing drink or is it a hot Starbucks Coffee?. Artist: Mr Clever Art. This artwork is part of the artist's Soda Pop Series. Artist: aelhra. SPRING BREAK (2013). only 30 total. part of the Rose-Tinted Sunglasses series. SOLD OUT ! Size: 18" X 24". "DECEPTION & DISORDER"by Shepard Fairey aka Obey Giant, released in 2017 by the artist. "Francisco Reyes Jr. and I have been working together for several years now, and we frequently talk about politics and social issues.